Vocabulary building has never been so adorable and fun! 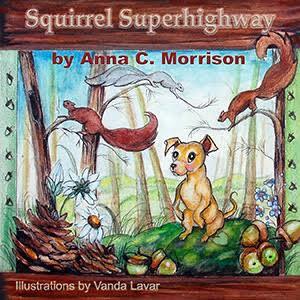 Squirrel Superhighway by Anna C. Morrison is a wonderful new addition to her other titles for pre-readers and early readers. Repetitive words and repeated sounds are blended together in this charming story about Duke, a dog who wishes to be a squirrel. As Duke watches the squirrel superhighway working above him, he wonders how he can best help the squirrels gather their nuts. In addition to a wonderful story, the beautiful artwork by Vanda Lavar will keep readers eagerly turning the pages to see what antics these animals are up to next. I loved the sweet ending and the closing illustration. Morrison has certainly found her niche. I look forward to reading more of her work. Beau is dirty. Theo is dirty. It must be BATHTIME! 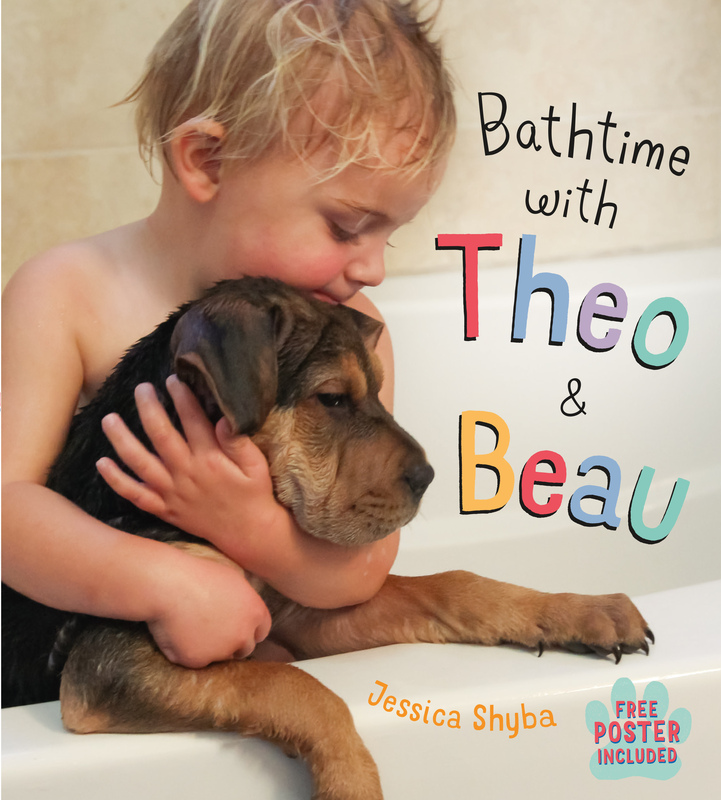 The only thing better than watching Theo the dog (part-Boxer, part-Shepherd, part-Labrador, part-Sharpei) curl up for a nap with his best friend Beau (a two-and-a-half year old toddler) is watching them having a blast together in the bath. The strong friendship, trust and love that was so visible in Naptime with Theo and Beau, is once again on full display in Jessica Shyba’s absolutely adorable and unbelievably charming photos. Prepare to have your heart stolen all over again by these world famous viral sensations! I would like to say thank you for this opportunity, sharing Mister Spunky and His Friends (www.misterspunky.com) and the story behind it. Prior to Mister Spunky and His Friends, I published an award winning book, Real Dogs Don’t Whisper (www.realdogsdontwhisper.com), which highlights my life journey caring for four special needs dogs and the life lessons they taught me along the way. The overall message within Real Dogs Don’t Whisper is about giving those with special needs a second chance. The book touches on integrity, unconditional love, leadership, trust, stopping abuse and opening your heart to receive and give both unconditional love and friendship. To lighten the message, I developed a co-author, Mr. MaGoo; Mr. MaGoo is my Lhasa Apso and he is larger than life. He adds humor within the book; sharing with the reader how life is so tough for him being the only male in the house and living with a crazy lady, me. Real Dogs has an audience from preteens to young adults to adults. I realized that I was missing an opportunity to reach children about the importance of love, friendship and helping others. I decided to take the story line and concept behind Real Dogs Don’t Whisper and place it in a picture book for children, even added coloring activities at the end of the story for children to color. Mr. MaGoo in Real Dogs Don’t Whisper is Mister Spunky in this children’s book. He enjoys life, has fun no matter what he is doing; and, helps others dogs he meets along the way to the beach. At the end of the journey to the beach, Mister Spunky has developed three new friends, each helping each other. The book touches on anti-bullying, friendship, love and helping others especially those with special needs. 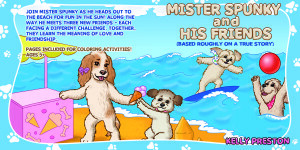 Mister Spunky and His Friends is ideal for children ages 5 to 10. Kelly Preston is, first and foremost, an animal lover. Raised on a ten-acre property in a small town in Pennsylvania, she grew up with horses, rabbits, and – of course – dogs. When she left home after college, she acquired Gizmo, an irresistible Lhasa Apso that started her on a journey full of joys and sorrows, hopes and tribulations, frustrations, endless lessons in patience, and above all else, love. All of this has come at the hands (more precisely the paws) of Gizmo, Betty Boop, Buffy, Carla Mae, and the inimitable Mr. MaGoo. Book 2 in the Planet of the Dogs series finds the dogs and Daisy and Bean up against another threat to peace, love and happiness. 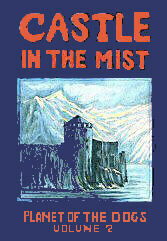 In a castle surrounded at night by a mysterious mist, Prince Ukko rules. The young prince, angry and hurt over the sudden loss of his father, whose fate is unknown, Ukko and his soldiers make war against neighboring peoples. When the traitorous Urch brothers, kidnap Nik and Nikki, the children of Bik, leader of the Stone City tribe, a year of peace that has reigned for the Stone City tribe is threatened. Will the dogs and Daisy and Bean be able to help rescue Nik and Nikki from the Castle in the Mist before it is too late for them to stop the Stone City warriors from unwillingly going to battle against Prince Ukko and his Black Hawk tribe? I’m impressed with the second book in the Planet of the Dogs series. Perhaps the smoothest flowing out of all three books, many of the charaters that readers have heard about in the first book, return in Castle in the Mist for another adventure. While still relying heavily on narration to move the story along, we see the results of what happened in Book 1 and how many of the characters work together to try and prevent the Stone City tribe from returning to their ways of war to rescue Nik and Nikki from the castle in the mist. There are many new characters to enjoy as well: the healers, Sola and Anga, the Douglas family, and many new dogs who have journeyed from the Planet of the Dogs by Miss Merrie and the dog council’s orders to help remind the people of earth about love, peace, and friendship. Having read all three books now, I have a better feel for the author’s vision for this series–at least, I hope I do. The illustrations provided by Stella M. McCarty add a great deal to the story. I look forward to many more books in the Planet of Dogs series. This is where it all began. 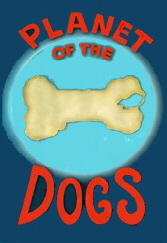 Planet of the Dogs is the first in the Planet of the Dogs series of books by Robert J. McCarty. The story begins “long, long ago” before dogs had ever come to Planet Earth. Many people helped settle the many beautiful areas of this planet, but with abundance came greed, and soon the people of Earth were threatened by warriors like the tribes of Stone City who had forgotten about love and friendship. Instead these warriors hurt people and stole from them. Miss Merrie, queen on the Planet of Dogs, along with the dog council, decide that something must be done; that some dogs will journey to the Planet Earth to remind the people of Earth about love and friendship, in the hopes that they can all live in peace. In this introduction to the Planet of the Dogs series, the Stone City warriors are set on invading Green Valley, where Tomas and Sara live with their children, Daisy and Bean. That is, until Daisy and Bean meet Lucy, Robbie, and Buddy from the Planet of the Dogs. The children journey to the Planet of the Dogs and learn of the dogs’ plan to restore peace. Is it possible that such strange creatures can convince Bik, the leader of the Stone City warriors, that all people can live in peace? Having already read, the third book in this series, Snow Valley Heroes, I was looking forward to seeing how the dogs had originally come to Earth. This book, like the others in this series, relies heavily on narration, as it is meant to be a story that is shared and read aloud. Actually, I think these would make excellent books to use in the classroom, as the concepts of problem solving, acceptance, and tolerance flows through all three of the Planet of the Dogs books. If you love dogs, enjoy fantasy, and like to share stories with the family, Planet of the Dogs will certainly be a good choice for you. 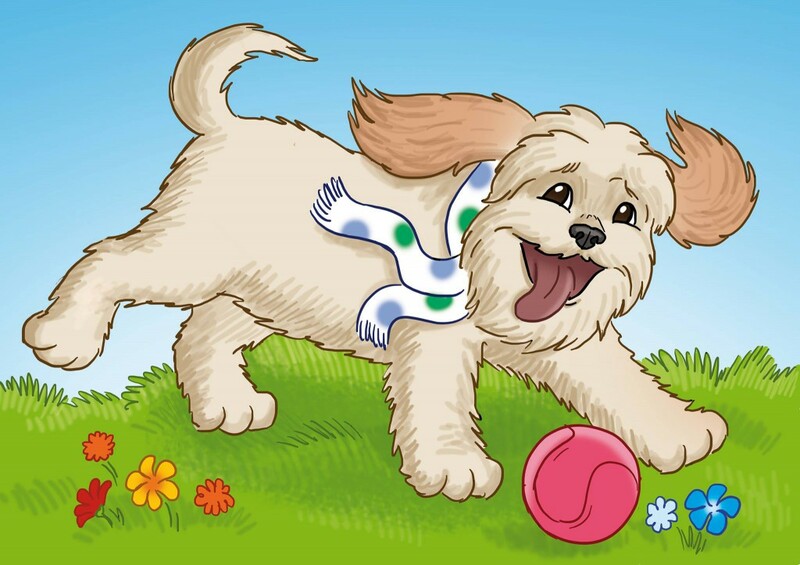 Children will love reading about Marcelo and his new puppy in Crash! by Mayra Calvani. Marcelo’s parents surprise him on his fifth birthday with a golden retriever puppy–the one thing he wanted more than anything in the world. Thrilled beyond all belief, Marcelo must now learn how to take care of his new puppy: feeding him, walking him, playing with him. But all that is easy compared to finding a name for him. Crash! is a charming story about a boy and his dog and the special relationship that develops between a child and his pet. Author Mayra Calvani shows off her storytelling talents once again, as she did with The Magic Violin. Calvani has a way of getting right to the heart of children with her touching stories. Kudos go out to young illustrator, Anna Pylypchuk, whose beautifully drawn illustrations bring Calvani’s story to life. My children each had their favorite drawings from the story. I can’t wait to see what Mayra Calvani’s next children’s book is all about!